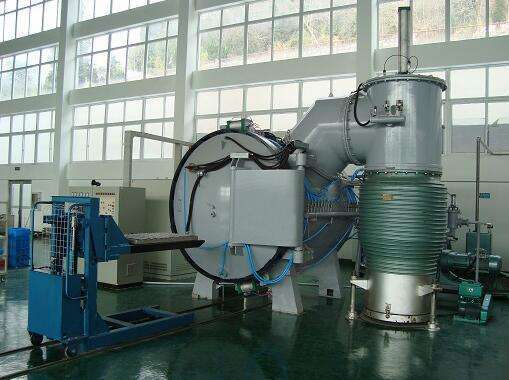 Horizontal Type Single Chamber Vacuum Annealing Furnace is outlined, the whole fiber double furnace plate type resistance furnace, the periodic operation furnace, special for the vacuum protection atmosphere of titanium tube, titanium alloy tube annealing heat treatment heating. The furnace and PID intelligent temperature program control system can automatically instruct, control and record the furnace temperature working condition. 2. Full fiber energy-saving lining, the composite brick and mixing furnace lining can save more than 30% energy. 3. Vacuum annealing furnace, furnace cover is equipped with fixed end and sealed vacuum muffle tank oven door the oven door is equipped with two Shared a furnace cover at the same time], furnace body is equipped with fixed end and vacuum muffle tank oven door seal fixed, the other end is open type, and a sealing device, making and moving the furnace cover with front split sealing paste and reliable sealing nature. 4. Vacuum annealing furnace and vacuum annealing furnace cover use knife type soft sealing side, between the furnace side knife were inserted at the time of entering the furnace furnace cover within the furnace cover fiber, makes the furnace and furnace sealed insulation, sealing is concise and reliable. 5. A roller groove is set up on the bearing base of the horse can, and the bearing roller is placed inside the tank. When the horse can expand and shrink, it can move in and out. A strong cooling fan and pipeline are provided at the end of the furnace, and the cooling rate of the furnace can be increased to improve the efficiency of the furnace.